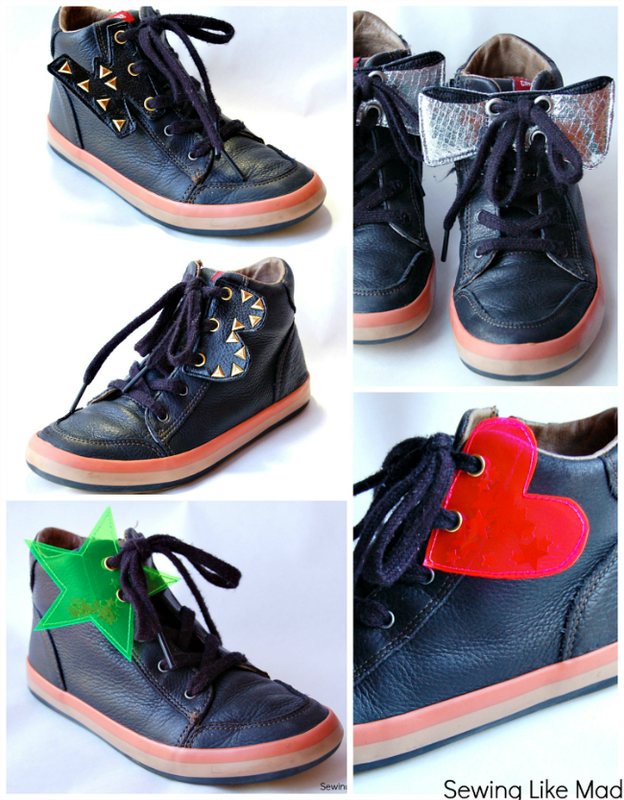 Sewing Like Mad: Cool Shoe Decorations - Tutorial. 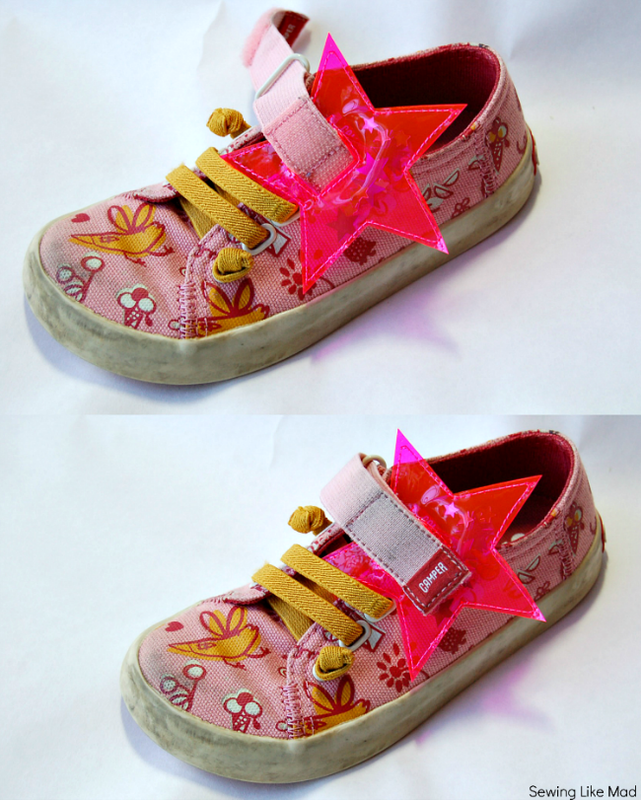 Cool Shoe Decorations - Tutorial. I have been waiting to bring home this last post I did for the Sewing Rabbit back in December until spring started....choosing to do that on the longest winter ever is just bad luck I guess, ha. Well, it is April and officially it IS spring so here we go. You might remember the golden wings that people put on their roller skates in the 70ies. Well, they are back and being produced by Shwings. I picked some up for Wilma at H&M who is always quick to copy trends, and I realized they are super easy to make. I was determined to make something in this category that I have not seen before and one of the ideas I got was to use this ultra cool fluorescent vinyl. (You might remember THIS rain jacket from my participation in Project Run & Play.) You can buy the vinyl HERE. And yes, that is star spangles I have put inside. Loose glitter would work too. I have a mini tutorial further down for the version for velcro but the concept is the same. And most of you probably don't even need a tutorial. Pretty simple but great effect, right. Here a pink heart version with big and small spangles inside. Sorry, this pink vinyl is crazy hard to photograph. They are easier to see in real life. 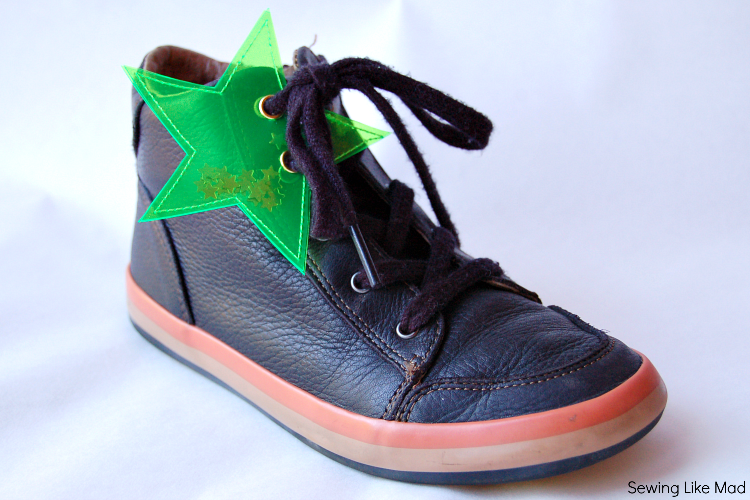 I also made a version for shoes with velcro. (sorry the dirty shoes but ahem no time to wash them before photo shoot). 1) Here you can see the materials I use. I cannot draw at all so making the star was actually really hard for me, ha. Now I wonder why I did not just search for a free printable somewhere? Oh well. Cut two layers of vinyl, put the spangles in between and stitch the two layers together - using some sort of teflon foot (as you can see in photo 4) or rolling foot. I used a neon embroidery thread for the stitching but anything will do. You can even use normal thread and sew all the way around twice for a more visible stitch if you don't have any thicker thread on hand. 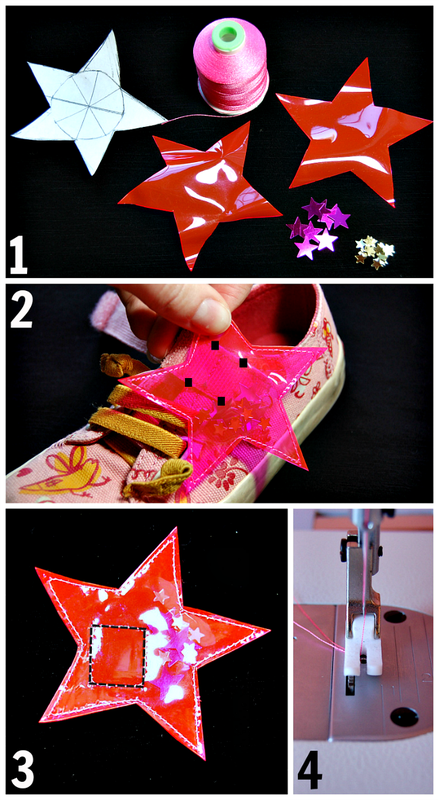 2) Now take the finished star and mark the hole for the velcro. 3) Stitch a square using the marks you just made. I have no photo showing this but I used a sharp knife to cut out the square 1 mm from the stitch. But this post is not done yet, woohoo. I chose to make my daughter's initials W and B as you can see above. But HI or YO or, well you name it! Or their age in a number on just one shoe...or on both for 10 years and up. 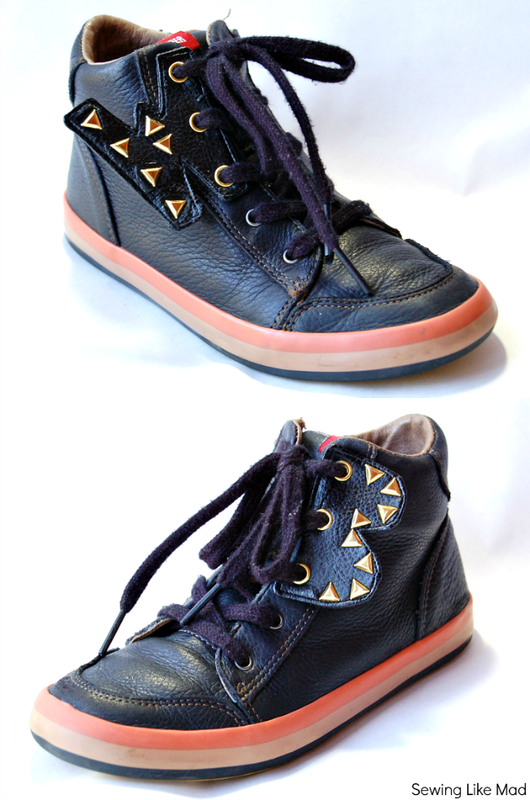 I used black pleather, gold eyelets and gold iron-on triangles (all supplies from Jo-Anns). And even though the iron-on triangles looks good it might not have been the best idea to put on pleather because they fall off easily because of the pleather's ultra smooth surface. Studs would have worked better! Or use some stronger glue since the pleather is not really happy to have a hot iron nearby for too long. BUT they made it through the photo shoot and here you can see the result and I am sure your head is already spinning with alternatives, right! 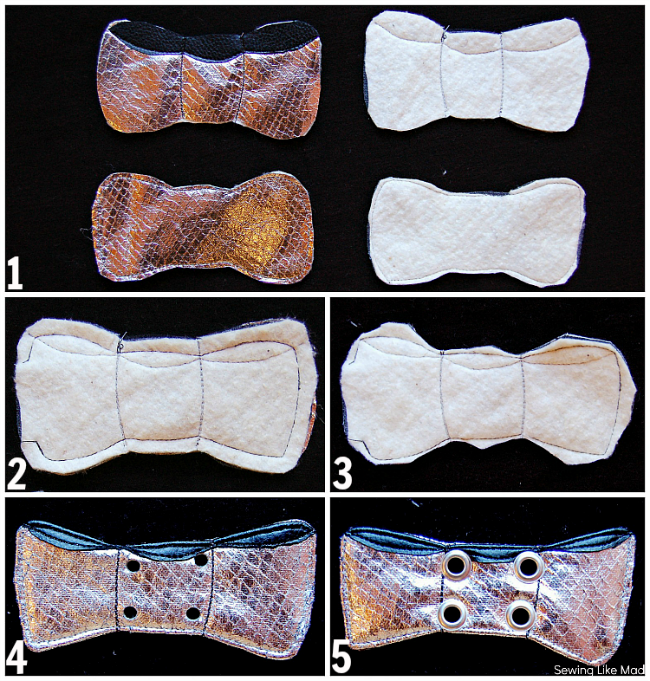 Last but not least I have made some pleather bows for you. I purposely made them look sort of hand drawn and yes, one side is a bit bigger/crooked than the other for that reason. Or actually they ended up like that when I drew the bow and I decided not to correct it - what can I say, it seemed like a good idea at the time, ha. Luckily you are making your own pattern/stencil and can make them perfectly symmetrical if you prefer that, right! 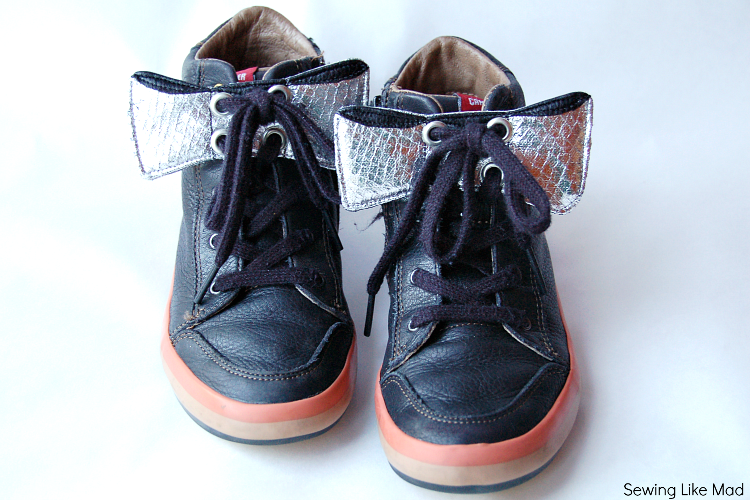 1) I used a textured silver and a smooth black pleather plus I added a layer of some thin batting to give the bow some structure and make it a bit more three-dimensional looking. I simply sewed the black pleather directly on the silver and kept the seam raw (since it is pleather). The two black stitches symbolizing the knot is made by sewing with normal black thread like three times on top of each other to be more visible. 2) Sew the front and back side together - right against right. Leave an opening in the side. I made my pattern with 0.5 cm since most was going to be cut of anyway so no reason to waste material. 3) And here you can see how much I cut of the seam allowance to make sure the curves and corner are nice and smooth when I turn the bows inside out. 4) Finally I stitch all the way around the bow which both gives stability and also closes the opening in the side. And lastly the stitch works instead of an iron to flatten the seams. Then you put four holes in...and no this crooked mess is not on purpose and should we just leave it at that, ahem. Luckily the tie bands will hide it, phew. 5) Add your preferred eyelets and you are done. These can of course be added anywhere on the shoes, not necessary on the top the way I showed you. 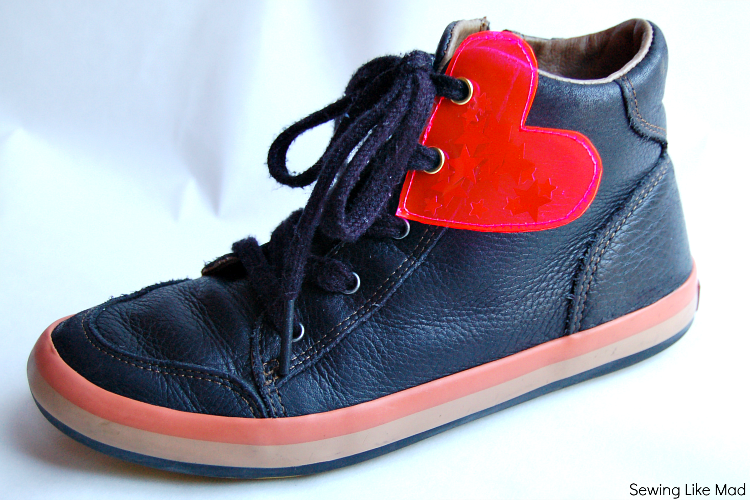 They would be super cute on the front of the shoe too. Oh, way too cool! My daughter would love these IF SHE WOULD WEAR SHOES. Can't really strap one of these to a rubber boot, can you? Seriously, I love these. You're cool. This put a MASSIVE smile on my face!